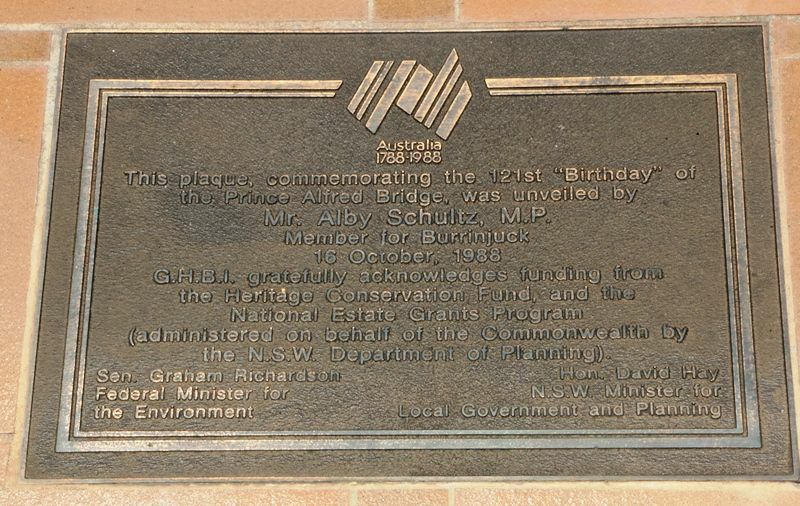 A plaque commemorates the 121st anniversary of the construction of the Prince Alfred Bridge. The Prince Alfred Bridge is evidence of the construction of a bridge over the Murrumbidgee River and its extensive floodplain between North and South Gundagai in 1867 and the completion of timber approach spans in 1869. The bridge is thought to be the first iron truss bridge built in NSW and the state's largest road bridge until 1932. G.H.B.I. gratefully acknowledges funding from the Heritage Conservation Fund, and the National Estate Grants Program (administered on behalf of the Commonwelath by the N.S.W. Department of Planning).